Storing your guns in a safe is important for keeping them out of the hands of children and criminals. Durability is one of the most critical features to look for in a gun safe. If you want to buy the best gun safe under 1000 dollars, check out our list below of the best gun safes within that price range. The Hollon Hunter Series Gun Safe HGS-16E has thicker steel than many other comparable gun safes. It’s the best gun safe under 1000 with 12 gauge steel on the walls and door. This gun safe features 1.25 inch bolts on all four sides to protect from pry attacks. The electronic lock is UL Listed Type 1, so it can withstand 1,000 newtons of bolt end pressure. Side punch attacks aren’t able to break the lock. Fire protection of 45 minutes. UL Listed Type 1 electronic lock. Almost impossible for thieves to break into it. You can see the keypad in the dark since it’s illuminated. 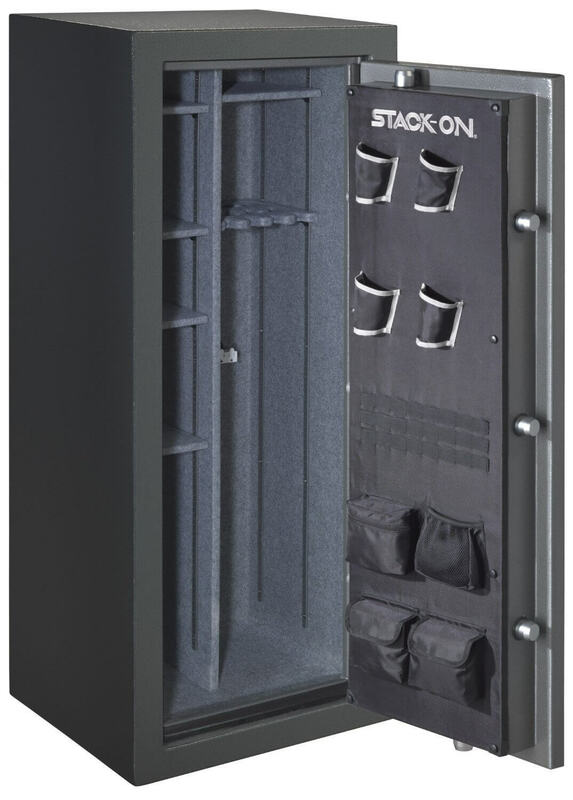 The Stack-On Total Defense 22-24 Gun Safe with electronic lock features four-way locking and 1.5 inch tapered live action locking bolts. Its backlit electronic lock has operational lights that alert you when the battery is low or entry is incorrect. A backup key comes with the gun safe. The Stack-On Total Defense 22-24 Gun Safe with Electronic Lock is waterproof in two feet of standing water for 72 hours. However, the safe needs to be bolted to the floor to be waterproof. It has a greater fire resistance than other gun safes on this list of 1400 degrees Fahrenheit for 75 minutes. 1.5 inch tapered live action locking bolts. Backlight on the electronic lock. Fire resistant for 75 minutes at 1400 degrees Fahrenheit. Waterproof for 72 hours in two feet of standing water when the safe is bolted to the floor. Fire resistant for 75 minutes. Waterproof in up to two feet of standing water for 72 hours when it’s bolted to the floor. It lets you know when the battery is low. The safe is only waterproof in a maximum of two feet of standing water and when it’s bolted to the floor. The Legion Gun Safe 5928 is the best gun safe under 1000 that has fully adjustable shelves and partition options. You can customize it for your needs. It features an alarm system and a combination lock. The gun safe provides secure storage of your guns. It has a 30 gun capacity. 1200 degree fire rating for 40 minutes. 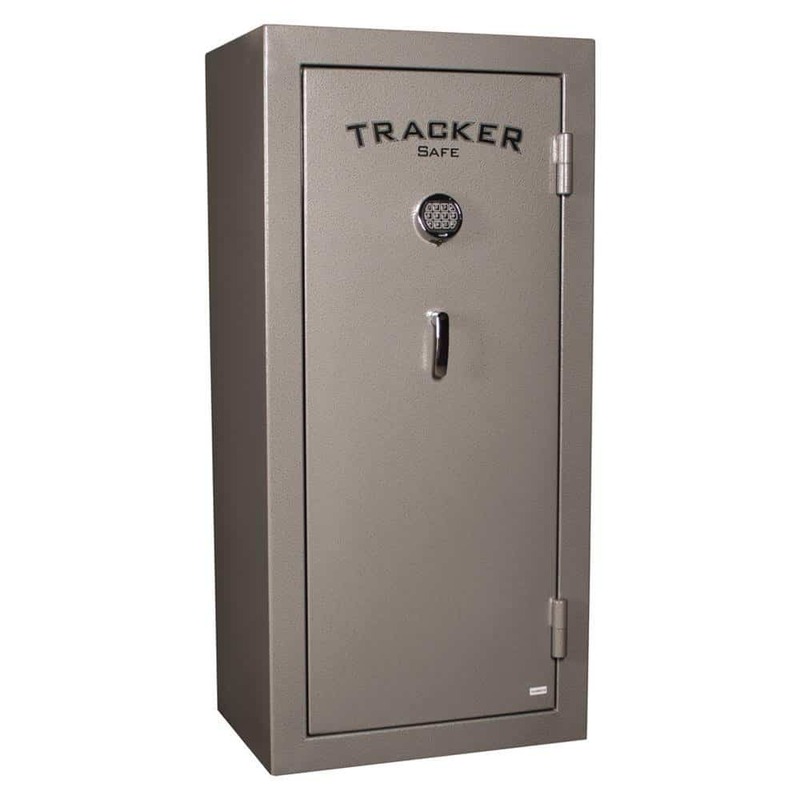 The Tracker Safe 30 Min Fire Insulated 22 Gun Safe with electronic lock is the best gun safe under 1000 that’s resistant to drill attacks. It has a drill-resistant hard plate that prevents the lock from being broken via a drill. The attack-resistant external hinges enable the steel door to open 200 degrees. This gun safe has a 30 minute fire rating at 1200 degrees Fahrenheit. 4.25 inch thick composite steel door. 6 gauge steel plate front. 8 x 1 inch diameter steel locking bolts. 30 minute fire rating at 1200 degrees Fahrenheit. You can anchor the safe to the floor. The safe can hold up to 22 guns. Its lock is resistant to drill attacks. The Amsec Gun Safe with electronic lock has a drill-resistant hard plate and an illuminated keypad. It’s the best gun safe under 1000 with three-way bolt work and an electronic lock. The gun safe has a fire protection of 30 minutes at 1200 degrees Fahrenheit. Its interior can keep the temperature under 350 degrees Fahrenheit. You can mount the gun safe to the floor via the four pre-cut anchor holes. Mounting hardware comes with the Amsec Gun Safe with Electronic Lock. Fire protection of 30 minutes at 1200 degrees Fahrenheit. Mounting hardware comes with the gun safe. It’s difficult for criminals to break into. A customer had trouble receiving the shipment because it was delivered on an 18 wheeler. Made of 12 gauge steel and a drill-resistant hard plate, the Mesa Safe 30-Minute Fire Gun Safe with electronic lock is durable. Thieves won’t have an easy time breaking into it. 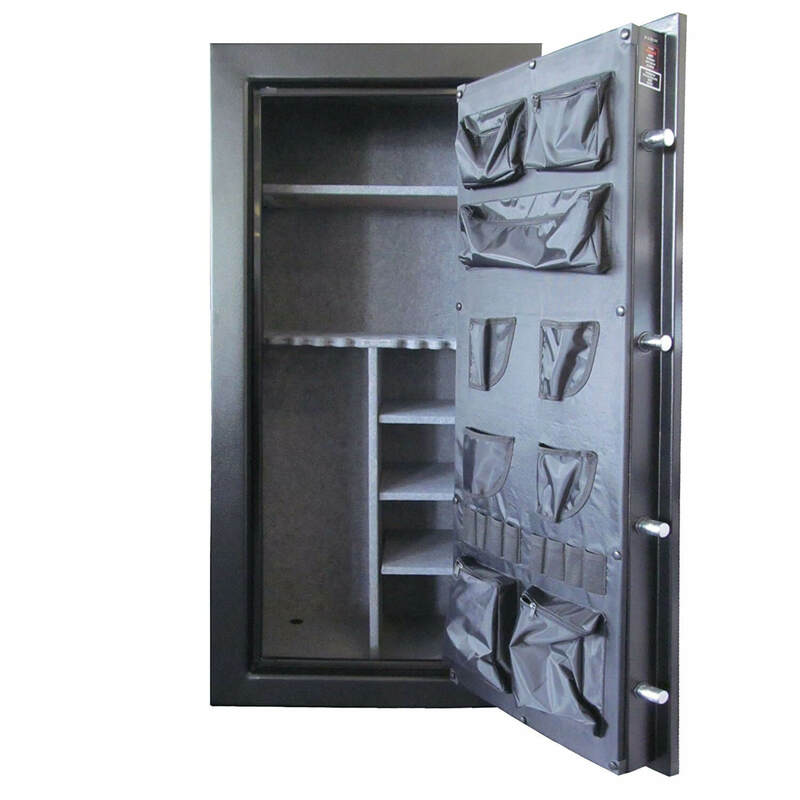 The gun safe features a carpeted interior, 24 gun capacity, and 180 degree door opening. An anchor kit comes with the Mesa Safe 30-Minute Fire Gun Safe with Electronic Lock. Internal power outlet and USB connection. Carpeted interior helps protect the finish on your guns. 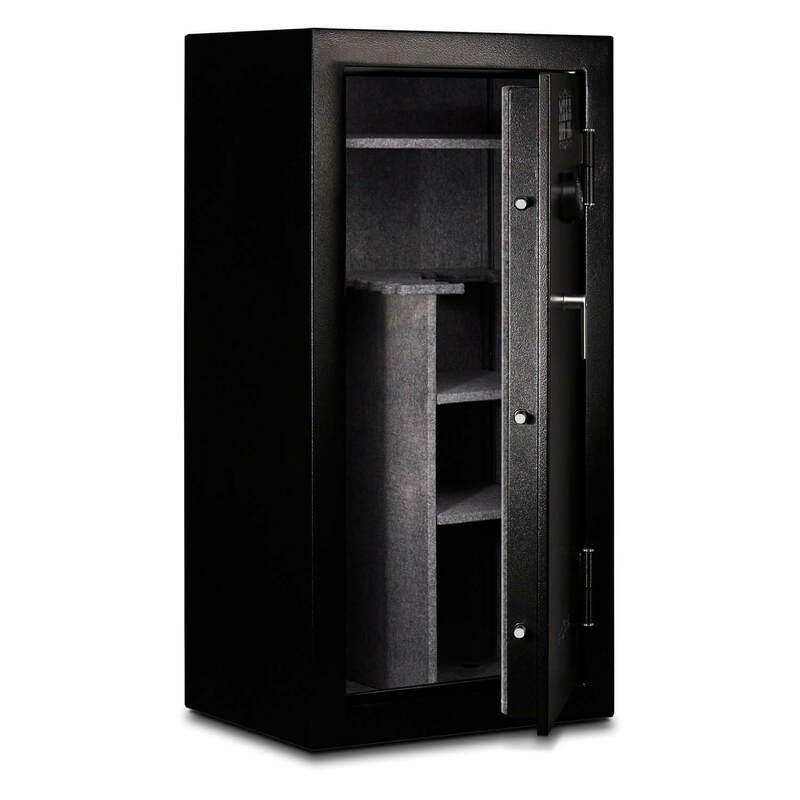 Fire resistance is lower than some of the gun safes in the same price range. 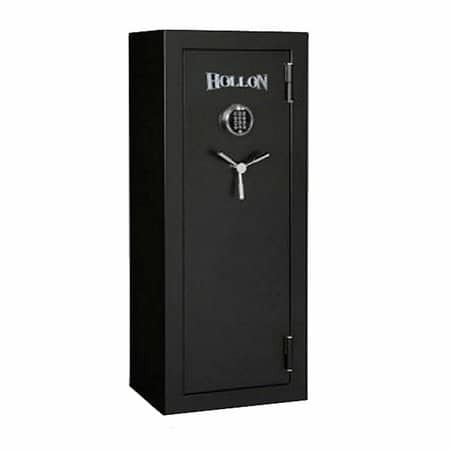 We consider the Hollon Hunter Series Gun Safe HGS-16E to be the best gun safe under 1000 dollars because it has a military-grade electronic lock. It’s virtually impossible for someone to break into it. All of the gun safes on this list are good choices if your budget is under $1000. They are durable and offer fire resistance for at least 30 minutes. Hey Buddy!, I found this information for you: "Reviewing the 6 Best Gun Safes under 00". Here is the website link: https://thegunrights.com/best-gun-safes-under-1000/. Thank you.